AMAZON HAS LAUNCHED a online hub dedicated to wearable devices. The section, simply called Amazon Wearable Technology, shows off devices such as smartwatches, activity trackers, wearable cameras, and devices to track your pets which customers can buy. It features products from established companies like Samsung and GoPro as well as from emerging brands like Misfit and Basis. Alongside the products themselves, Amazon has also included a “learning center,” providing guides on wearable tech and how said devices work, and video tutorials showing them in action. Amazon is hoping that by educating buyers about wearable technology, which is still a young industry, it will convince customers to visit more and purchase such devices directly from the store. Speaking about the news, Amazon’s Director of Wireless and Mobile Electronics, John Nemeth, said the decision to give wearable tech its own section was down to it being a industry that’s developing quickly. Wearable technology is an exciting category with rapid innovation and our customers are increasingly coming to Amazon to shop and learn about these devices… We’re thrilled to bring our customers a store with the largest selection and great prices that helps eliminate the guesswork when deciding which wearable devices best fit their needs. A number of companies have entered the wearable tech market, with some major companies focusing on smartwatches. Some like Google have created a new operating system called Android Wear for smartwatches while the likes of LG, Samsung and Motorola are creating their own versions. Email “Amazon moves into wearable tech by launching dedicated store”. 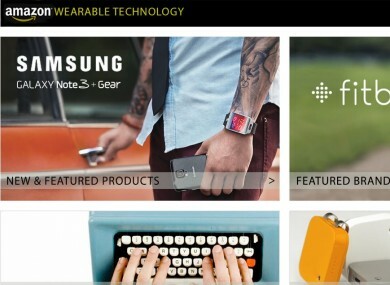 Feedback on “Amazon moves into wearable tech by launching dedicated store”.